When people talk about the top brands when it comes to making sound instruments, Yamaha will never miss on that list. The company has now unveiled a starter guitar known as the Yamaha C40 GigMaker. If you are looking to help your kid learn the guitar lessons even better, it is time to get this model today. Let us get to look at some of the features that have made the guitar so popular among many guitarists. Many things go into making the guitar easily playable or not. You need to find a model that offers easy playability, especially if you are a beginner. The C40 model should be one of those models that give you the best playability. So what makes the model this great? This model is designed to have a great design and shape that makes it possible to hold with ease. The beginners can now enjoy using the guitar for different occasions as it can fit in their hands easily. If you are new to using a guitar, sometimes it is better if you can actually hold the guitar in your hand and feel it first before buying. You can test it out at any local shop first before you can buy online if that is what you want. One of the features that can make an acoustic guitar playable should be the weight of such a guitar. Many people who are always looking to play a guitar would want to know more about the weight of a guitar before making a decision. From the description of the model, this guitar is seen to be very lightweight. It should be comfortable for the kids or older beginners to find it easy to play the guitar. Some would just think that having an acoustic guitar would be one that is boring, so long as it is working. That should not be the case for you. It is important to choose one that looks and works great too. The C40 model has a great appearance that will make you appreciate the craftsmanship of the company. The traditional high gloss finish is what you will find on most classical models today. Well, you guessed it right as it is also what you get with this model. The overall design should simply make the model quite appealing to many users. For any type of guitar, the type of sound that you get from the model is always important to ensure that you get to end up with an impressive guitar. For a person who is just learning how to play a guitar, the Yahama C40 model should provide sufficient sound for such a person to practice playing the guitar. Most users would be looking for a guitar that gives a rich and warm tone. Well, if you get to tune it correctly, then you are in luck with the model. It should be the best way to lay the foundation and start playing the guitar with ease as compared to other models often described as the best for beginners. To help learn how to play the guitar faster and easily, it is always advisable that you play around with the factory strings. As much as it may not have the super high-quality sound, it is enough to help you learn more about playing the guitar. For a trained ear, sometimes it feels like the C40 is lacking some of important sounds. It may not project the sound as you had hoped for, and it is the reason the model is best for the beginners. Unlike other models on the market today, the Yamaha C40 is not going to have much of a problem when it comes to the workmanship. You will not have to worry about its quality, as the manufacturer is already known for making the top range instruments with amazing quality. The manufacturer used the Javanese rosewood fingerboard, which should deliver the best durability for the model. The wood might be susceptible to denting, but that should not be a problem at all. If you are careful, the wood would stay looking great for a long time to come. The wood might dent, but the overall body structure will always remain solid. Some users have claimed to have dropped their guitars at it remained in shape at all times. You too could benefit from owning such a guitar as it will keep on looking and working great for many years to come. It always feels great if you can buy a model that is within your skill set. It is the same thing that the beginners feel when they get to buy the C40 model today. It feels right at home knowing that the model comes from a top brand in the industry known for making the best sound instruments. Many who have used can agree that there are close to none defects with the C40 that might affect its playability. With its smooth neck and appropriate size, it is possible that many more people would want to have one for themselves, especially if they are just starting out as beginners. The thinner body and shorter scale length should make the guitar feel comfortable for anyone looking to learn the art of playing guitar easily. This can be a huge advantage to those who are always thinking that playing guitar is hard for them. On overall, this is a great model that many beginners can enjoy using today. It is designed with a nice compact body that should make it possible for the users to feel being part of the guitar. For any person who has not used a guitar before, you can always be sure that it will end up having a great time practicing thanks to the nylon strings. 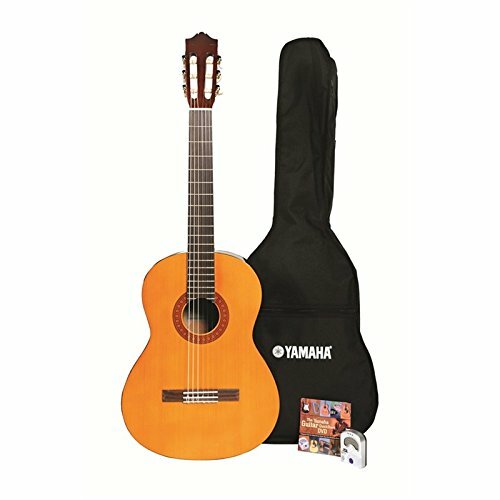 The Yamaha GigMaker Classical Acoustic guitar is one instrument you can appreaciate if you are a beginner and even an experienced player. The model has been designed to make it easy for the users to enjoy a great time using the guitar more often. You too could benefit from such a model thanks to its affordable price. Go ahead and get one for yourself.